My non Muslim brothers and sisters this is the introduction of Allah very shortly. But I want to describe some details in light the Holy Quran. But I want to describe the religion of Islam in the light of the Holy Quran. Allah is one and he has no partner. He has been forever, even before this world came into existence and even when everything will vanish he will still be there. His existence is free from all human necessities. He is the creator of this universe; he created mankind from mud, demons from fire and angels from light. He has created life within a life and is the creator of everything in this universe. This knowledge is unlimited. No one can posses these characteristics and therefore we should only worship Allah, as he is the creator of everything and is our LORD. And worshipping of any other living or non-living thing is forbidden in Islam. It is forbidden to worship anyone besides Allah and also to associate some one with him. He is free from any relations and worldly needs. I pray to Allah that me he lead us all to the right path and also to give us enough Common sense that we start to judge what is right and wrong. I think that no any one who can say that this introduction is fit for any one from mankind or angles or demons? So it is right for Allah that he should be worshipped only and it is right that all religions in which is concept of worshipping to any one except Allah is wrong or cancelled. It is very stranger that we say about any body that he is a God or son of God and say about him also that he uses the eating things because then we will accept that he has need to go to discharge the food too? I think it is very bad but insult him. 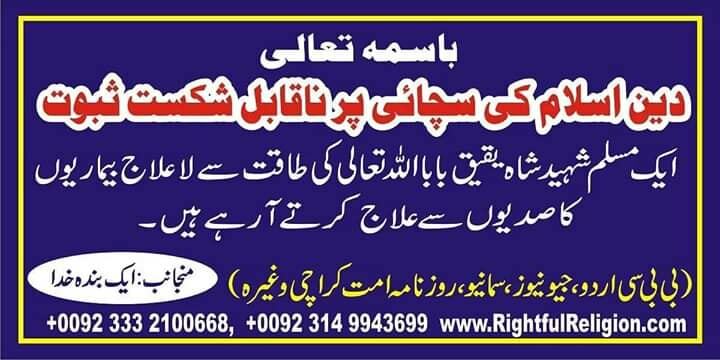 Therefore Almighty Allah has cancelled the all religions in which is concept of worshiping the mankind or angles or demons etc. I pray to Allah that he give his guidance and common science to all persons. Amen.